How to Choose the Best Website Maintenance and Support Services? Building a website requires a lot of resources in terms of money and time. Also, after building, you need to assume a certain degree of responsibility to ensure that you continually and optimally reap the benefits from your website. To achieve this, opting for the most efficient website maintenance and support services plays a pivotal role. It helps to maximize the returns from your existing business website. This article discusses the importance, benefits and costs of a dedicated website maintenance process. What is Website Maintenance And Support? Website maintenance and support is the process which ensures that your website consistently delivers the best user experience to your target audience and is equipped to bring in and retain the potential customers. 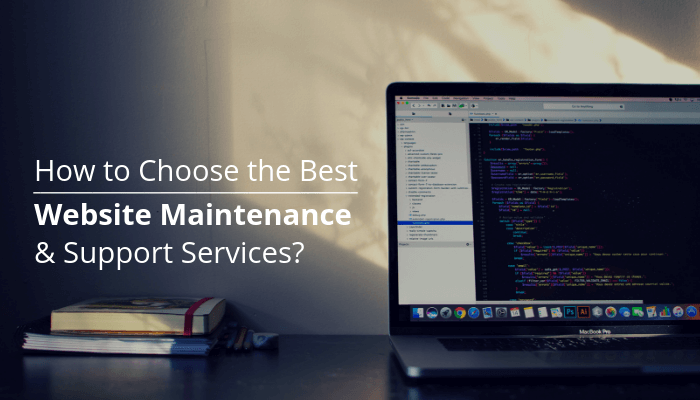 Do All Websites Need to Opt for Maintenance & Support Plans? The maintenance and support service is indispensable for every website. At the onset, especially if you’re on a budget, you might feel that website maintenance is an expenditure that you can avoid. However, it is recommended to opt for the maintenance services to pursue your long-term goals. Maintenance is vital to rake in the results it was built for in the first place. However, the extent of attention and focus you may need to devote on the same depends on several factors. As a fact, the type of maintenance services depends on the nature, complexity and purpose of your website. If your website has a huge quantum of content or a sizeable amount of daily or monthly traffic, you will have to devote more attention towards making your website capable to handle that load. Simultaneously, you will also need to ensure the proper security of your website assets and your customer’s data. If your website is small (more like just a portfolio page), you could do with lesser but regular attention to ensure it is serving its purpose optimally. Non-functional elements, broken links, slow load speed, etc, discourage your potential customers to stay on your website or revisit in the future. Inconsistency in design and content might also hamper their on-site experience. Regular maintenance & support ensures that all the elements which build up the overall user-experience are in smooth order. Moreover, a regular review of the analytics also helps to tailor and optimize the web pages as per how the customers are responding, and offer them the best experience. Search engines prefer those websites that offer great UX and include the updated and highly-relevant content. 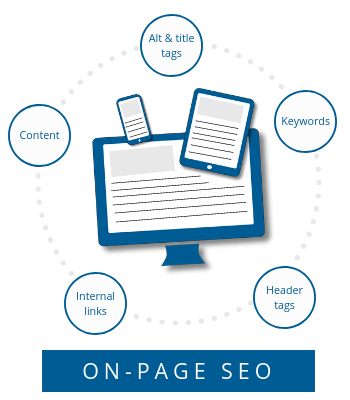 However, to be discovered, the content on the site needs to be as per the SEO norms. Website maintenance efforts covering on-page SEO take care of these content updates and help to improve your web traffic from search engine. Website security is very important to protect your web assets and customer data. Regular maintenance follows the necessary steps to mitigate the risks of data attack or theft due to hacking. Timely renewal of SSL certificates, software updates, and removal of an infecting virus and restoration of order in case of attacks are some of the ways by which maintenance helps to protect the integrity of websites. In case of any unforeseen problem, your site might need a rebuild from scratch. Regular backup of your website is extremely important to ensure that you don’t lose out on precious data. Both, code and content for any website needs to get back up. The maintenance service providers ensure that this part is not missed out due to negligence or other sudden problems. Websites are often built making use of software and plugins. Plugins are like mini-applications and they lend functionality. However, they routinely expire and need to be upgraded from time to time, both to upgrade the technology and to ensure security. Sometimes these updates are not compatible with the existing website framework and tend to break features. Having an expert analyze and take care of these things, ensures a thorough upkeep. Some problems when avoided turn bigger and bigger. If neglected for a long time, they reach a stage where not only it is expensive to fix, but also difficult and time-consuming. Timely intervention often avoids an occurrence of such backend problems. The team that regularly works on your website has a firm grip over its elements. In case of big issues, they’re able to address it much quicker due to prior understanding. Moreover, regular contractual customers are bound to receive priority during the emergency, which is a big plus. Well, it is possible to maintain the website yourself. However, in the ideal sense of the word, you should not attempt to take on the task on a DIY mode to avoid the expenses. Maintenance requires dedication and regularity if you desire effectiveness. Proper maintenance means you need to follow a timely schedule, which can go haywire if you juggle it with the other aspects of your business. Experts possess technical expertise in handling website specific issues. They’re better equipped to detect problems and fix them before they turn large. Moreover, in case of any mistakes, they know how to handle it best. Example – Say, you update a plugin, but feel that there’s some problem after the update, and you wish to undo. Now, suppose you don’t know what is causing the problem and which backup you should restore. This might mean that you’ll be forced to revert to a very old backup and lose out on content significantly. In case of a big problem, you will have to reach out for external help, which you might not get on priority then. Even if you do, the external team could take extra time to understand your website from scratch. This loss of time can cost you significantly in addition to the hefty charges at that urgent point. What Are The Types Of Website Maintenance & Support Services One Can Opt For? Instinctively, need-based website maintenance and support services is what attracts most of the small and medium businesses. In the need-based services, you can opt for professional help for exactly the specific task you may need on an actual basis. The professional or the company may not be available promptly as and when you need them. Naturally, they will prioritize their regular maintenance contractual work over flying customers. This might mean a lot of trouble in case you need help with a pressing issue that demands instant attention. Due to lack of regular monitoring, small issues may escalate into large ones, making up significantly for your cost saving from maintenance charges. In the hourly contracts of maintenance services, you need to commit to a certain number of billable hours that you would like to be dedicated to your website towards maintenance. Hourly contracts are like any other contract, but don’t have any fixed set of deliverables, but rather have fixed hours. You can get the service team to work on maintaining your site for any areas you feel are pertinent at the moment. The good part is that it ensures that your site at least receives regular and dedicated attention. However, it also requires your intervention to assign the appropriate tasks to the maintenance team for best results. If you want your website to be maintained regularly and thoroughly without any need for your intervention, package based contracts work best. These contracts essentially include a fixed list of maintenance tasks best suited for your website and are performed at the relevant frequency interval agreed upon. In case you need any additional service at any point, you can add it to your billable on an actual basis. It is commonly seen that these additional services come at a discount for package-based contracts. What Is The Cost Of Website Maintenance & Support Services? The cost of website maintenance varies from agency to agency, depending on their knowledge, infrastructure and expertise. If we are to generalize, it’s safe to say that the cost depends on factors such as the number of man hours needed, along with the level of expertise and intervention frequency required to maintain your website properly. You might feel that need-based should be the cheapest, but in reality, when problems are big due to negligence, they can turn out to be really costly, and exceed the cost saving. If you have a contractual, retainer agreement with a service provider, any additional problems that you need help for on your website will turn out to be much cheaper. Ideally, when you are evaluating costs, you must check that the company is transparent in its billing and processes. You should also look out for flexibility of the plans, along with the presence of a dedicated support portal to manage your maintenance issues. Website maintenance and support is the fuel needed to run your website smoothly. It might feel like an expenditure, but actually, it is an investment to gain maximum benefits from your website. The extent and type of maintenance you need depend on your website, and the role of your website in your business. The key to proper maintenance is regular, dedicated intervention. That’s best-taken care by outsourcing the task to a reliable agency. 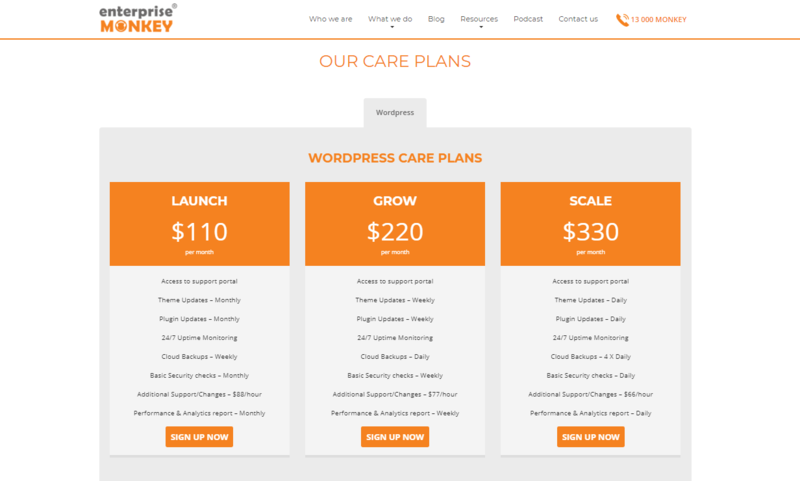 Are you looking for cost-effective maintenance and support plans for your business website? Opt for Enterprise Monkey’s website maintenance services and let us care about your website.